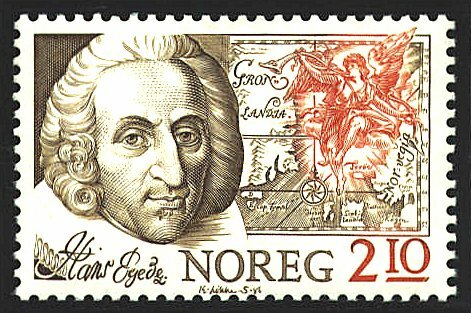 In 1721 the Danish king provided financial support for an expedition under the leadership of the Norwegian priest, to Greenland to convert the Greenland Vikings to Christianity. However, though the king did not know it the Viking settlements on Greenland had disappeared by the beginning of the fifteenth century because of increasingly severe winters. Hans Egede turned his missionary attention to the native population, and established a Scandinavian colony. Egede was an educator, author, natural historian and cartographer, in addition to his ecclesiastical office. Soon after he returned to Copenhagen in 1737 he drew a map of Greenland, the oldest surviving map drawn by an inhabitant. The map on the stamp may also be by Egede. An interesting feature of the stamp is the national designation Noreg. While there are some countries (Canada for example) which have more than one national language, Norway has only one language, but two expressions of it. Riksmal or Bokmal was the official language of Norway until 1885. Its spelling and grammar are largely Danish, and reflects the long Danish rule in Norway. Ivar Aasen devised Landsmal or Nynorsk based on the dialects of western Norway. In 1885 it was given equal standing with Bokmal. In practice local custom determines how place names are to be pronounced. The name of the country also occurs in two versions, Norge in Bokmal and Noreg in Landsmal. Both spellings occur on Norwegian stamps. Although the use of one version or the other does not seem to have any logic to an outsider, it probably has to do with the subject of the stamp, and the use of one or other language expression in connection with that subject.